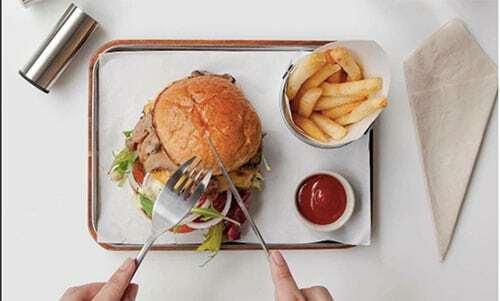 Eat Healthy in Bangkok is a sleek website connecting health-conscious Bangkokians with local restaurants through dining reviews, recommendations, and a fun, interactive restaurant map. Based on its archives, the website was launched in March 2017 by Joëlle Smaniotto, a French native and seasoned expat who recently moved to Bangkok. 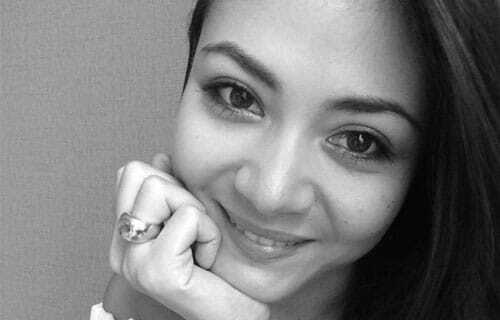 Her goal is to promote healthy eating and living amongst fellow city dwellers through the growing network of restaurants on eathealthybkk.com. The first thing we noticed on the homepage was the quirky, eye-catching logo and header at the very top. The top menu is easy to navigate and there aren’t any cluttered or confusing drop-down options so you won’t get lost while exploring. The website design feels modern and minimalist with professional looking graphics against a white background. Any millennial will quickly feel at home in the grid layout and most all other users will appreciate the design for its no-fuss, user-friendly navigation that’s still visually appealing. The main content on the website is blog posts split between Bangkok restaurant reviews, and fitness and wellness advice on a variety of topics from eating raw foods to visiting a detox spa. One fact that we liked and that’s worth noting was that all of the recommendations are based on Smaniotto’s personal experiences. Every time we browsed, the website was ad-free and there wasn’t any waiting time for web pages or content to load. The coolest feature that we loved on the website is the interactive “Healthy in Bangkok Map” that lets users search for and quickly find restaurants all over Bangkok. Bonus points for adding a filter that lets you narrow your search based on what type of restaurant you’re looking for, be it a new brunch spot or somewhere to satisfy your sweet tooth. The map is a Google Maps extension so it’s familiar and comfortable to navigate. At first glance it’s littered with clusters of location pins, so we recommend zooming in to specific locations. Hovering your cursor over the location pins gives the name of the restaurant. When you click on the location pins around the map a small info box pops up with a quick description, popular menu items, and “What We Loved” as well as all the business details if your search requires further sleuthing. If you’re feeling adventurous and location isn’t a factor, all of the restaurants are conveniently listed in a type of directory right below the map (Tip: we advise random scrolling and where your mouse stops is your next dinner date!). The website is responsive (proportionately shrinks to fit your screen or the size of your tab) but the map is best viewed in full-screen mode. In fact, the only thing we wish we could change about this feature is for the map to be able to be full screen (rather than embedded) to make searching and reading the information boxes easier. But don’t let that stop you from exploring! Though the highlight of this website is definitely the Healthy Map, the blog posts and articles are also worth checking out. Though there are only a couple of blogs posted each month, we enjoyed the topics they address and they make for a fun read. Smaniotto writes in a conversational tone that’s not pretentious and is still informative enough that you feel like you’re walking away from a quick chat with a friend about her latest health tips or restaurant recommendation. 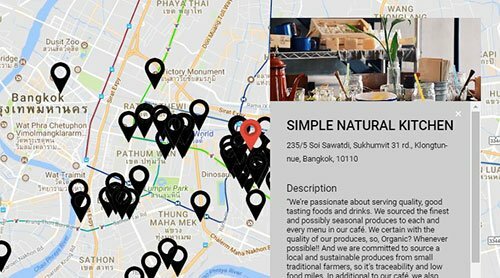 If you’re new to Bangkok or just looking to change up your dining routine and try somewhere new to eat, eathealthybkk.com is a good website to go to for down-to-earth recommendations and fun restaurant discoveries with their interactive map.